Every week send any Vikings-related questions to @Andrew_Krammer and he'll answer them here on Fridays. Every week send any Vikings-related questions to @Andrew_Krammer and I’ll answer them here on Fridays. A: This is true, the Vikings may not be rushed into making that decision until 2018. Teddy Bridgewater, who is still rehabbing on the reserve/PUP list, is currently set to become a free agent next spring. However, the Vikings are aware his contract will be extended to next season, or ‘toll,’ should he be on PUP “as of the sixth regular season game,” the collective bargaining agreement states. Well, he’s already on PUP for the first six weeks, by NFL rule. Where things get sticky, a league source told the Star Tribune this summer, is the rule of time spent on PUP can be interpreted to be the entire season. Bridgewater is eligible to practice after six weeks and, if he and the NFLPA believe he can pass a physical, could return or threaten a grievance. The Vikings hold the franchise tag over Bradford, who could theoretically play well enough this season to earn a long-term deal and end the starter debate. Do you feel if Tramaine Brock is active this week he will start at slot corner? A: Probably not this week. Brock told the Star Tribune this week he’s not yet comfortable enough in the playbook with the nickel corner position to jump in and play at Heinz Field on Sunday. Brock, the 29-year-old veteran traded from Seattle two weeks ago, said he is ready to make his debut as an outside corner with the Vikings after dealing with a groin injury. In the slot, I’d expect Terence Newman to continue leading the way with Mackensie Alexander possibly rotating in again. 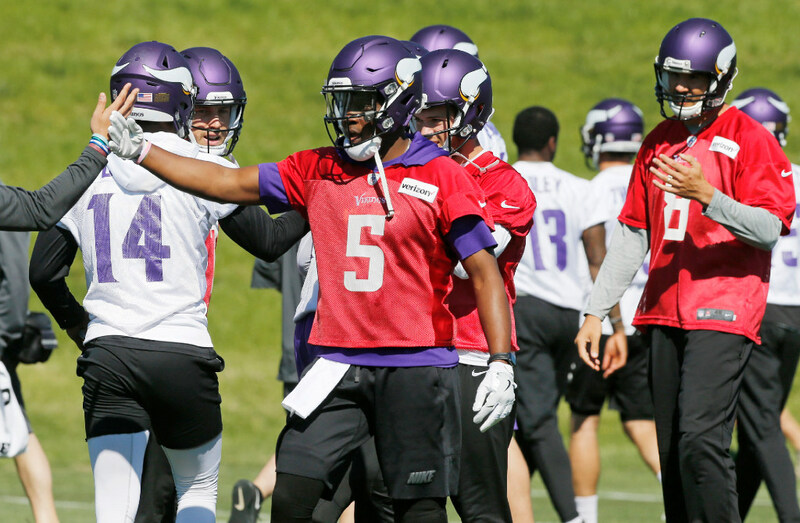 What is a realistic projection for Diggs and Thielen? Can they both go over 70 catches and 1,000 yards? 6-8 TDs? A: If that’s the case, a pair of 1,000-yard receivers (they haven’t had one since 2009), then you’ve got yourself a playoff team. Barring injuries obviously, it could be that simple given the defensive strength and how the offense was retooled around the run game. Realistically, defenses won’t be playing single man-to-man coverage on both Diggs and Thielen throughout games like the Saints. You’ll see tight end Kyle Rudolph get his games and receiver Michael Floyd, perhaps even Laquon Treadwell, could become more involved. The matchups were just too good and wide open for Bradford to overlook on Monday night. So Barr…hurt already. Vikes keep him even thought he’s looking injury prone? This is his contract yr. Correct. Beast when healthy..but? A: This isn’t technically Anthony Barr’s contract year. He’s under contract next year on a pricey fifth-year option that could make him one of the league’s highest-paid 4-3 linebackers in 2018. But he has found himself on quite a few injury reports in his young and budding career. This time he’s dealing with a hamstring injury suffered Monday night and has yet to practice this week. It could be precautionary given his injury history, or he could be set up to miss Sunday’s game — the seventh of his four-year career. We’ll know more later this afternoon. Regardless if he’s playing 100 percent, the Vikings want to see Barr’s play raised to the level he’s shown flashes of in the past. He just needs to be on the field, where Barr could earn a lot of money. What’s up with sams knee? A: At this point there doesn’t seem to be any concern about his availability for Sunday in Pittsburgh. Anyone following the Vikings knows they’ve established a culture of not discussing injuries. But Bradford tweaked the knee against the Saints and still played every snap. He’s been at least limited in practice throughout the week. Caution is obviously the best approach for a roster so recently troubled by critical injuries on offense.
.@Andrew_Krammer when Michael Floyd returns how does that affect time for Treadwell and Wright? Who then gets more snaps Tread or Wright? A: That will be an evolving situation hinging on how Treadwell and Wright play in the next three games before Floyd’s return in Week 5. The Vikings are giving Treadwell his chances. He played a career-high 36 snaps against the Saints, but Bradford kept finding wide-open targets in Diggs and Thielen throughout the night. Some calls were also installed for Wright. And Floyd, suspended three more games, was one of the three best receivers in camp, so he’ll presumably have a role upon returning. What’s clear is the Vikings are going to have more receivers involved, even breaking out a four-wide set Monday night that wasn’t often seen under former coordinator Norv Turner.